The British National Party (BNP) has launched its Welsh assembly election manifesto by saying a key priority is tackling a multi-cultural society. The far-right party said the "main burning issue" in some areas of Wales was the number of migrants from Poland. It is fielding 20 candidates, four in each of the five regional lists. Its manifesto, called Putting People First, also calls for the sacking of North Wales Police chief constable Richard Brunstrom. At the manifesto launch in Swansea, the BNP called all devolved responsibilities of the assembly meaningless. But it said there was much that could be achieved through the assembly, including using influence to pressure the Westminster "regime" to withdraw from the European Union. The BNP said putting up a record number of candidates in an assembly election was an opportunity for all voters in Wales to show their support. 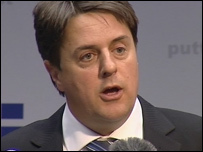 BNP leader Nick Griffin, who lives near Welshpool, Powys, said "the main burning issue of the day in Welshpool and Newtown is Polish people. Jobs for the local people have all gone to the Poles." He said: "People in Swansea, Wrexham and Welshpool and all over Wales know now that there is a need for the BNP." The manifesto lists 12 key priorities, which also include " rebuilding democracy and dismantling state surveillance, which includes the sacking of Richard Brunstrom". Other points include calls to "slash the council tax burden encompassing abolishing all multi-cultural and politically correct posts and ending the funding of all multi-cultural, multi-ethnic and politically correct schemes." The BNP also wants "a home for all with priority given to local people, a healthy nation with no recruitment of staff from abroad and the cutting of bureaucracy," and "putting Welsh culture first and maximum support for the Welsh language in appropriate areas". What happens next in the Bay?